Ethics and compliance officers have many opportunities to leverage the data in their hotline and incident management systems to improve their compliance programmes— and their organisational culture of ethics and respect. This year’s benchmarks point to several opportunities to increase programme effectiveness. 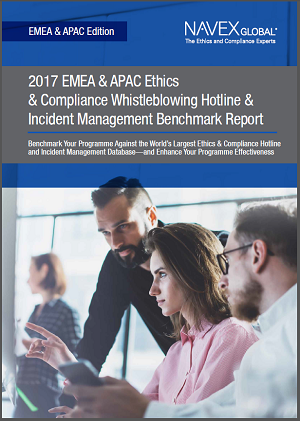 Hotline data that is carefully tracked, reviewed, benchmarked and presented with sufficient context often provides the early warning signs needed to detect, prevent and resolve problems. We at NAVEX Global hope that this report is helpful to your organisation and we welcome any feedback on these findings.